Irish graffiti artist Maser has transfigured a derelict gas station in Limerick City, Ireland, into a beautiful public art installation inspired by an American artist associated with the Pop art movement. The new urban art installation interestingly named “No.27” is one out of 20 series of redesigned sites organised by Limerick City of Culture. 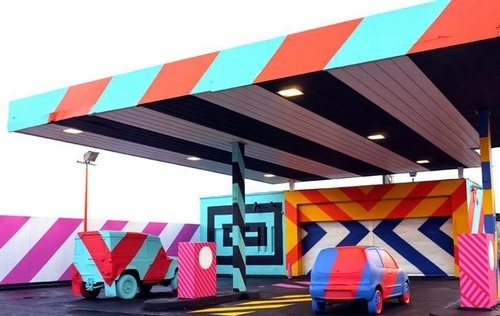 Maser has certainly transformed the abandoned gas station into an explosion of neon colours and shapes. The bold colours compliment each other creating a dynamic energy and a brighter and a much more alive place. It’s worth a visit if you’re nearby… just make sure you fill up your tank first. Tweet us @iitsnews and let us know what building you would makeover.